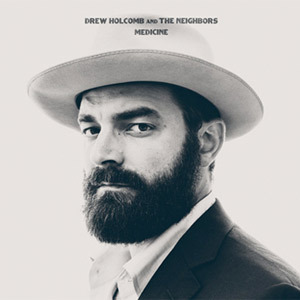 Drew Holcomb and The Neighbours are in the process of releasing their brand new album 'Medicine', which will certainly cure the monotony of life with its rich, sentimental vibe and smooth folksy rhythm. The compilation even includes singer Holcomb's wife Ellie, who adds to the love song attitudes of such songs as 'American Beauty' and 'You'll Always Be My Girl'. True to his roots, Holcomb has very much emphasised his Tennessee background within this album. 'American Beauty' is well-picked opener to the album. It has a relaxed pace to begin with, and gradually brings in the guitar-led rhythm. Soothing, well written and very much an easy listening number reminiscent of Ben Howard's 'Only Love', there's a sweet acoustic rhythm accompanied by soft vocals complimenting the subtle tones. Each track has a strong but measured beat throughout, and Holcomb's voice is often complimented by his wife's sensational backing vocals, which makes the overall sound much more flattering. Some numbers were quicker in pace and style, such as 'Sisters Brothers' and, in comparison to Holcomb's previous successful album 'Washed in Blue', these songs are much more generous with their musical detail. The album won't be released in the USA until January 27th 2015. It is undoubtedly expected to be a hit though, judging from Holcomb's huge success with 2005's 'Washed in Blue', which was featured on popular American TV shows such as 'The United States of Tara' and 'Army Wives'. Fans are undoubtedly eager for the bands' upcoming tour and so they should be; the band themselves admitted this album could be the best of their career yet.